I volunteered to make a cake for the cookout to celebrate my cousin’s graduation from college. My aunt asked for a sheet cake and said either chocolate or vanilla is fine. Well, I’m incredibly indecisive, so I decided to make both chocolate and vanilla cakes. Then, I had the dilemma of choosing the frosting. Chocolate or vanilla? Hmmm… Yet again, I was unable a decision. So, I decided to do a sheet cake that was a double layer cake, with chocolate on one side, vanilla on the other, with chocolate frosting in between the layers, and vanilla frosting on the outside. WHEW! Have I lost my mind? Now, I’m not usually one of those bloggers that tells you a story. 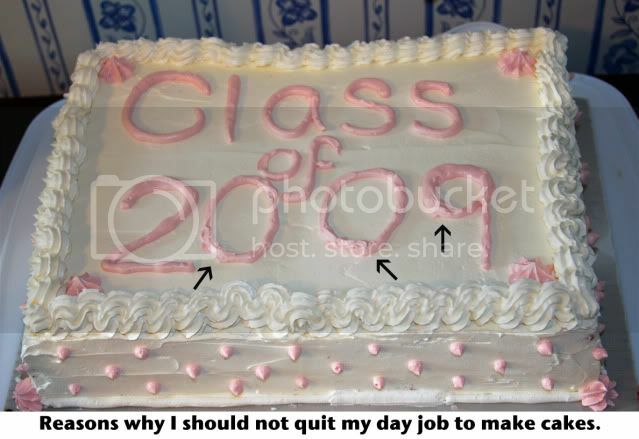 But because this cake was to celebrate a graduation, let me tell you a bit about mine. Graduation is a momentous event in anyone’s life. It’s a milestone of course. It’s a moment when you’re in between where you’re going and where you’ve been. I remember the day I graduated college. At the time, it felt more like a formality. Just something I should do because, everyone does it. It’s what you do when you finish college. As I sat outside on an unusually cold May evening, in the drizzling rain (sounds fun huh?) at my commencement service, they called for the moment of silence. Right then, I suddenly heard “She works hard for the money…. So hard for it honey…” sung by Donna Summer. Whoops, I had forgotten to turn my phone on silent, and it was one of my best friends calling to congratulate me on graduating (which I hadn’t done yet actually). Yes. My ringtone at the time was Donna Summer “She Works Hard for the Money”. I no longer use “She Works Hard for the Money” as my ringtone. But it was very fitting for the time. I lived and went to school in Bowling Green, KY, an hour north of Nashville. The summer before my senior year I was accepted as an unpaid intern at an incredibly cool, amazing company down in Nashville, in post-production. I still lived in KY, but drove down 4-5 days a week for this internship (when gas was $3 a gallon). I also continued to work at the television station I had been employed at for the past year in Bowling Green 5-6 days a week. There wasn’t a single day I wasn’t at least at one of the two places, and many days I went to both. The hard work during my internship paid off, and my supervisor asked if I’d be interested in working freelance, when they needed me. That then turned into a regular schedule working 2 days a week (while still working 4 days a week at the tv station in KY. Yes, I had two jobs in two different states on top of attending class). The following semester I left the job in KY and moved to Nashville to work 3 days a week, and commuted to class twice a week (my boss actually told me to just quit school, that it was just television and no one would care if I had a degree or not. I think he was only half kidding). Also, when I say I worked 3 days a week? Yeah, scratch the day part, because I actually worked NIGHTS! Sometimes I would get off work at 1am, and have to be in KY the next morning at 9am for a class. Oh, and I still hadn’t written that 6 page paper. Sound crazy? Yeah… It kinda was. I was precariously close to having a nervous breakdown multiple times. It was hard. I felt like I had a foot in two places. I had the school life in KY and responsibilities there, including papers, and trying to arrange production planning, and shooting & editing schedules for my video projects. But then I would leave all that behind when I crossed the state line to TN. At work I might be given a HUGE workload, and asked to do as much as I could. So I pushed myself to do as much as I could each night I was there, to prove to my employer what kind of worker I was. At times it was OH. SO. HARD. I cried. I wanted to quit; not the job, and not school, just life. I wanted a break from life. I just had to keep looking down the tunnel, at the light, the LIFE, at the end of it. But you know what? I did it. I survived it. The thing that kept me going was knowing, without a doubt, that I was heading towards doing what I had always wanted to do with my life. Ever since I was a little girl, I would play with the family video camera. I did workout videos with my brother, infomercials with my friends, soap operas with my friends, stop motion animation with my Beanie Babies (hey, at least I found a use for mine, what did you do with yours?). The internship, as I said, lead to a job in that department; though I still wasn’t doing the job I wanted to do yet, but I was in television, and I was learning about the television industry. And now, three years down the road, I’ve been doing exactly what I love to do for well over a year now. I have days where I pinch myself, and say “Am I really here? Did I really do it? Is this what I’m really doing?” And I’m not asking myself this because of WHERE I work, which is pretty cool; I’m asking myself this because I am truly one of those fortunate individuals who is doing what they love to do. There are days I can spend 8-12 hours editing and it feels like only a couple hours have passed. I love what I do, how many people get to say that? I’m not in this for the money, because, despite what people might think, you won’t get rich being a television editor. So… I no longer work “hard for the money”. I work hard because I’m doing the job I always dreamed I would have. One more thing, then I swear I’ll quit rambling. As I’ve begun to bake & cook more, people at work always say, “You could be a chef!” or “You should open a bakery!” And I always reply, “No, I’m doing what I love right now. I love to edit & work in television. I enjoy baking, cooking, and blogging; but I enjoy it as a hobby. It would drive me nuts to cook or bake all day, every day.” I truly believe I am doing my vocational calling. I guess because blogging is only my hobby, I have ABSOLUTELY NO PROBLEM giving credit where credit it due. If I followed a recipe exactly as it was written, I’ll say “from ____”; if I adapted a recipe I say “adapted from _____”; and if I was inspired by a technique/recipe/product, I’ll be sure to mention “inspired by ____”. I enjoy following recipes. I enjoy browsing recipes (that’s probably why I love delicious so much, it’s fun to browse recipes using their bookmarking tools). Most often I have no desire to make up my own recipe. I like the “hunt” of finding the perfect recipe. 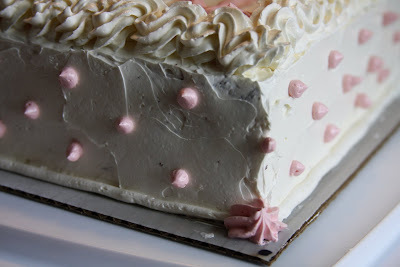 When I decided to make both chocolate & white cake, I needed a white cake recipe. I already have a “go-to” chocolate cake recipe. It’s Hershey’s Perfectly Chocolate Cake. It’s so moist and delicious! If you’ve never made it, you should really consider it next time you want to make a chocolate cake. I’ve paired it with Pumpkin Cream Cheese Frosting for Halloween cupcakes; for my birthday using the Special Dark Cocoa with White Chocolate Frosting, and for The Boy’s birthday with Salted Caramel Frosting. Every single combo was AMAZING. Up until now I’ve never actually paired it with their Perfectly Chocolate Frosting. I always felt that chocolate on chocolate is a little much. I actually think this cake compliments and is complimented by having, another flavor paired with it. So that’s why I chose to put the chocolate frosting in between the layers. I did a LOT of searching. I even read a great comparison post about white cake recipes by an amazing blogger who writes these incredibly helpful reviews of multiple recipes. But, in the end, for some reason I settled on a recipe from Baking Bites. Heat oven to 350°F. Grease and flour 11x7-inch baking pan. Bake 30 to 35 minutes or until wooden pick inserted in center comes out clean. Cool 10 minutes; remove from pan to wire racks. Cool completely. Preheat oven to 350 F. Grease 11x7-inch pan with vegetable shortening, line the bottom with parchment paper, grease the parchment paper and flour the pans. Pour into prepared pans and gently shake to smooth batter. Bake 30-35 minutes, until toothpick inserted into the center comes out clean. Let cake cool in the pan for 15 minutes then invert onto rack to cool completely before frosting. 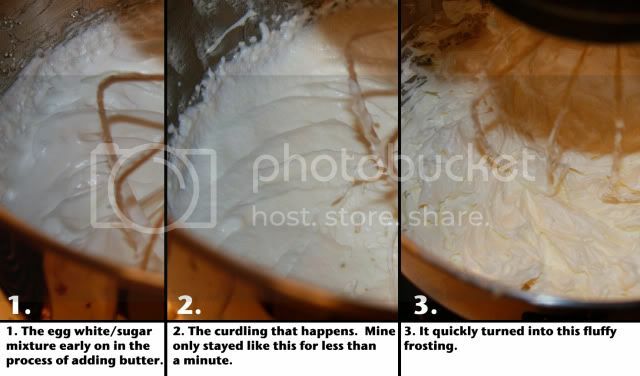 Unfrosted cakes can be frozen for 1-2 weeks. Melt butter. Stir in cocoa. Alternately add powdered sugar and milk, beating to spreading consistency. Add small amount additional milk, if needed. Stir in vanilla. About 1 cup frosting. In the bowl of a stand mixer, place egg whites, with cream of tartar and 1/4 cup sugar nearby. Heat 3/4 cup sugar and 1/4 cup water in a small saucepan. Heat over medium high heat until sugar is dissolved. When sugar reaches 230F on a candy thermometer, turn mixer on medium high. When egg whites are frothy, add cream of tartar. Gradually add the 1/4 cup sugar. When egg whites begin to form soft peaks, turn the mixer down to medium low and begin to drizzle in the boiling sugar mixture (which should be at approximately 245-250F, firm ball stage). When all of the hot sugar is added, turn the mixer up to medium high and beat until the bowl is no longer warm to the touch. 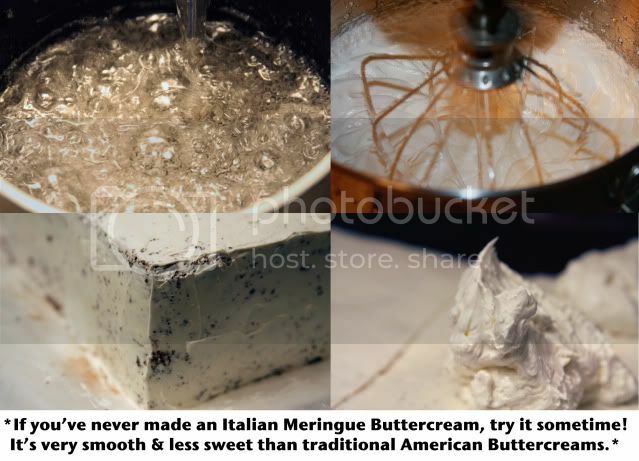 Add the butter one lump at a time and continue beating until mixture is smooth and fluffy, approximately 12-20 minutes. It will look rather like ricotta cheese for a while - just keep beating! Once it is smooth, stir in flavorings, if desired. Keep at room temperature - do not refrigerate. Cut both sheet cakes in half as if you were cutting down the spine of an open book. Remove the left side of the vanilla, and the right side of the chocolate and set them aside on wax paper. Place the two remaining chocolate & vanilla pieces together. 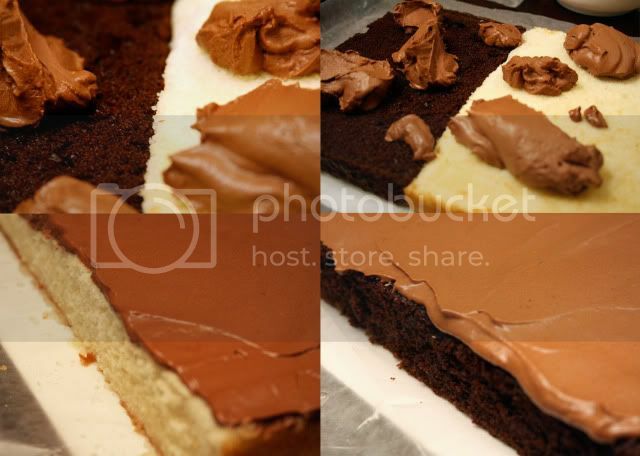 Spread chocolate frosting evenly over the layers. Place the layers that were set aside, on the correct flavored layer (the chocolate on the chocolate; and vanilla atop vanilla). 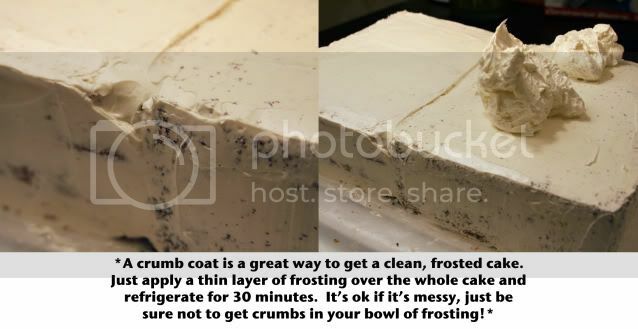 Spread a "crumb layer" over the entire cake. Place in refrigerator for a while to set. Once set, spread the remaining frosting, and decorate as desired. PS. 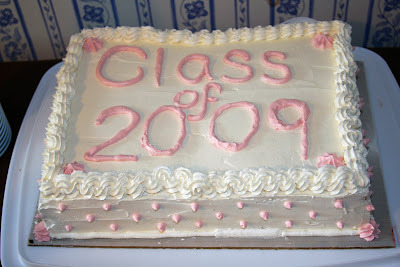 If you want the truth, I chose to write “Class of 2009” because the chances of spelling “Congratulations” correctly with frosting at 2:30am were VERY slim. Seriously. It turned out great! Great job-especially using the two different kinds of cake! I bet that took you forever! LOL I have made that icing before isn’t awesome!!! I like how it decorates/spreads better. Great job Erin! It turned out very pretty and I’m sure it was delicious! Great job – I love how you made two different flavors! That’s awesome that you love what you do! I like what I do (cancer research), but I work such long hours that I’m afraid I’ll burn out eventually. that looks amazing! i loved the icing! the cake looks extremely moist and spongy! Great job Erin 🙂 I’m sure your cousin was a happy person! I love your ambitious nature and feel inspired! I hardly ever bake-I like to cook, but not bake. It intimidates me too much! I’m also impressed with those close up shots- were they taken with your new camera? Looks great! I think I might have to try this out for my husband’s bday next month! Quick question – I’m guessing that I can easily substitute a different type of cocoa powder instead of using Hershey’s? PS – Thanks again for your great choc.chip cookie recipe – it’s already been requested by my father-in-law for Father’s Day! Great job on the cake and I love all your pics! This looks beautiful! And great tips! Congrats on a great job!! 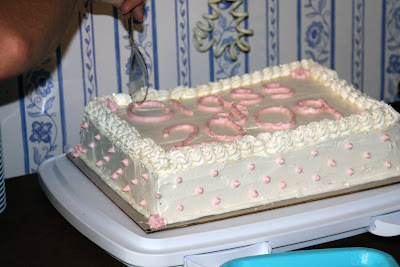 The cake turned out wonderful. This post had me cracking up! You did a great job. Thanks for this post. Not as brave as you, using Betty Crocker everything. I thought I could pick up an undecorated sheet cake for my son’s birthday. I ordered a personalized frosting sheet with a character on it. I’ve been to every supermarket, no luck bought cake mix just in case I come up empty after a morning bakery run. As forv not melting the butter before making the chocolate frosting its not so much a difference in consistancy as it is in flavor. When you melt the butter and add the chocolate it makes it taste like fudge the same goes for peanut butter. Either way it taste’s great. This is known in industry as Monte Carlo style cake.